Guardian tubular pulling solenoid. 24v DC. Continous hold. 0.5 - 20 lbs. Pulling 96 lbs. 1.17"L. Mounts in 0.65" hole. Alt. P/N: T8X9-C-24VDC. 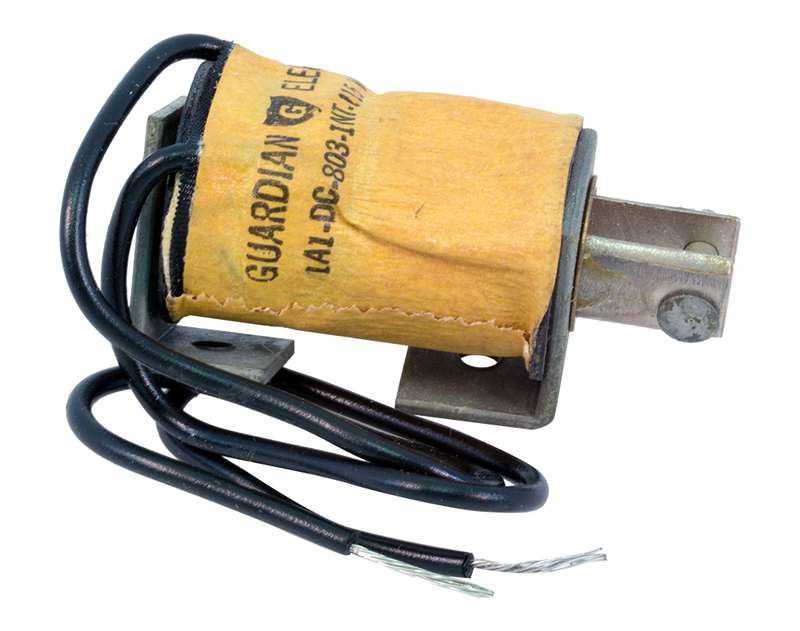 Guardian "pushing" or "pulling" solenoid. 220v, 50 Hz. 3"L x 1-1/2"W x 1-3/8"H. 1/8" shaft. 5/8" travel. 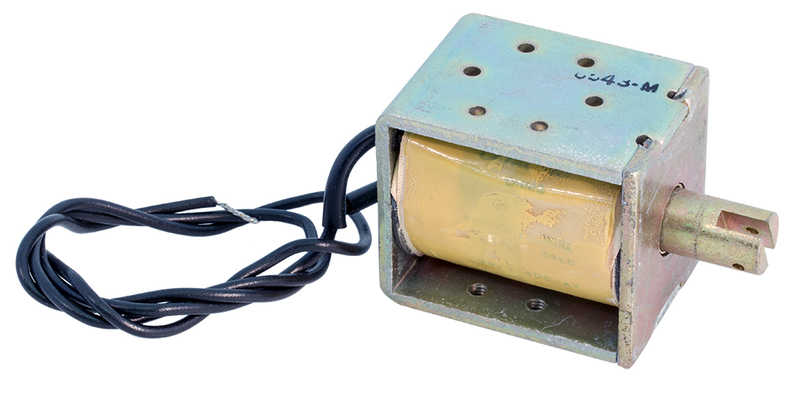 Ledex low profile solenoid. 21-67 vdc. Push or pull. Well suited for battery operation. 0.156"D shaft. 1"D x 0.5"H. DLA900-84-M-CP85. NSN: 5945-01-176-4358. Guardian pulling solenoid. Continous duty. 115v AC. 1/2" x 2-5/8"L slotted plunger. 1-1/2" x 1-5/8" x 2"H. Circa 1961. Philtrol pulling solenoid. 12v DC, 11 ohms coil. 1500 turns, #24. Plunger is 1/2" x 2-1/4" with slotted top. Mounts by 4 tapped holes on frame. 0.488" x 0.940" centers. 1-13/16" x 1-9/16" x 2-5/8"H (with seated plunger). Guardian pulling solenoid. 24v DC, 50 ohm coil. Plunger is 1/2" outside diameter x 2"L. End is NOT tapped. Mounts by single #10 center screw or by four tapped 8-32 holes on frame. 1-3/8" x 1-5/8" x 2-1/4"H (2-5/8"W plunger seated). 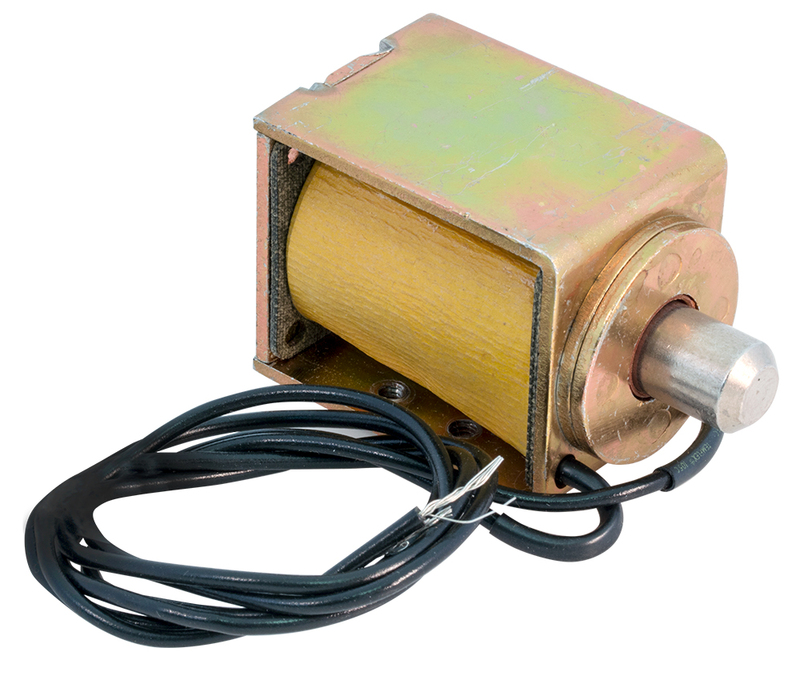 General Electric pull type solenoid. 120v, 60 Hz. 16 lbs force. 1.25" stroke length. Acutator 0.432" I.D. pin hole. 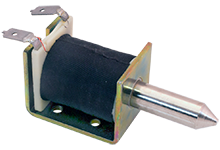 3-7/8" x 2-7/8" x 4"H (actuator retracted). Alt P/N: CR9500-C102D77E. NSN: 5945-00-689-7852. 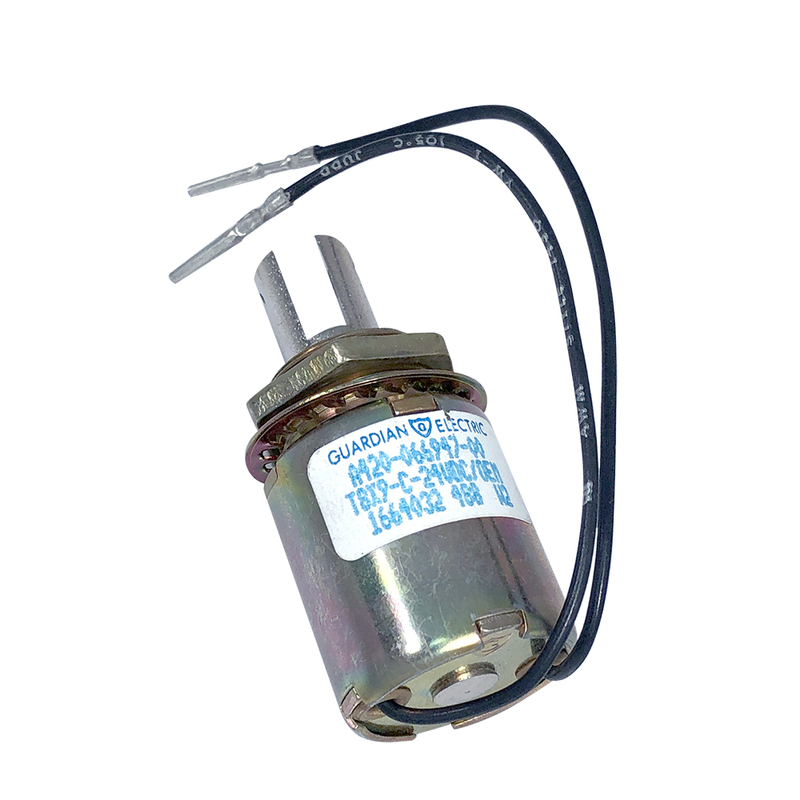 Guardian long life DC tubular solenoid. 24 vdc, 347 ma, 69.1 ohms. Intermittent duty. 14 oz. pull force @ 0.05", 1.50 oz. pull force @ 0.375". Mounts in 3/8"D hole, 2" behind panel depth. Includes mounting bracket. Alt. P/N: A420-064829-00. Liberty Controls linear pushing solenoid. 240 vac, 60 Hz coil. 3/8" travel on #6 threaded plunger post. Dimensions: 1-1/4" x 1-1/2" x 2". Hart-Advance solenoid. 24 vdc, 198 ohms. 7/16" diameter,3/4"L shaft. 1" x 1-1/4" x 1-3/4" overall (retracted). Pulls. Solenoid. 12 vdc, 59 ohms. Otherwise, same as above. 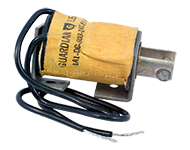 Guardian Electric solenoid with pulling plunger. RoHS. Coil: 12 vdc, 0.65 amp, 18.4 ohm. Solder tabs. Intermittent Duty Cycle. 1.19" x 1.19" x 1.88" coil. 5/16" diameter x 2.08" plunger. 0.082" wide x 0.4" deep slot with 0.092" diameter hole. Guardian Electric pulling solenoid. 12vDC, 19 ohm, 0.63 amp continuous duty. 150 oz holding. Alt P/N: A420-065762-00. Deltro L armature relay. No contacts. 1/32" armature travel. 0.952"d coil. 24v DC coil. 1-1/2"H x 1-1/4"d overall. 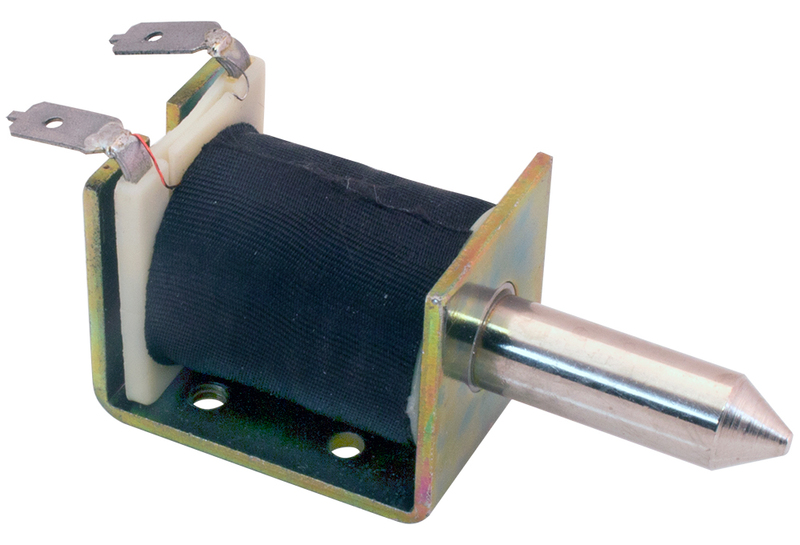 Linear solenoid. "Pulling" type with manual air damping adjustment. Includes3" long chain drive and plunger. 590 ohm coil. Operates 24 - 115 vdc. 0.69" diameter piston. 1.14" linear piston travel. 4.32" long (retracted), 2.08" deep. Made for Harris Broadcast for use in Criterion 80 playback unit modification. Weighs 2.25 lbs. 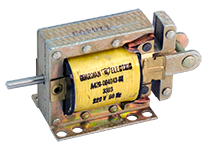 Solenoid coil, 510 ohm resistance. Brass center tube is 0.685" I.D. Solder lug terminals. New coil only - used in (GAT) 994-6992-001. 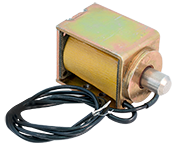 Linear solenoid has 6.5 pounds linear pushing force. 3/8" max stroke. 12 vdc, 12 amps. 2-1/8" outer diameter x 4-1/2" long. 3/16" bore in connecting rod. Guardian Electric pulling solenoid. 12 vdc, 12.5 ohm coil. 5/16" diameter piston with unique locking clasp on piston head. 9/16" travel. 1-3/16" x 1-1/8" x 1-1/16". 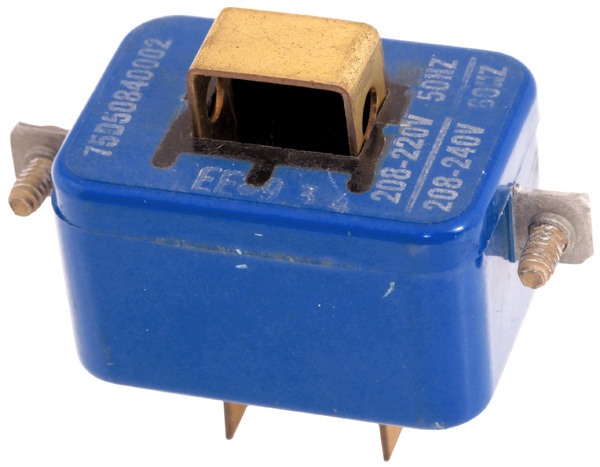 Electrical solenoid. 20 - 30 vdc. Push stroke - 1.25 ounces. Stainless steel. NSN: 5945-00-409-0576. 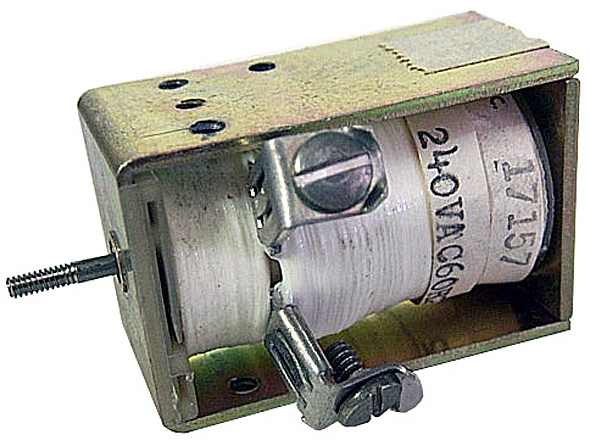 Solenoid, 24 vdc. Catch release - pulls in on energize. Stainless steel. 4 hole flange. 1-1/8" c-c.
Nylon connecting arm. 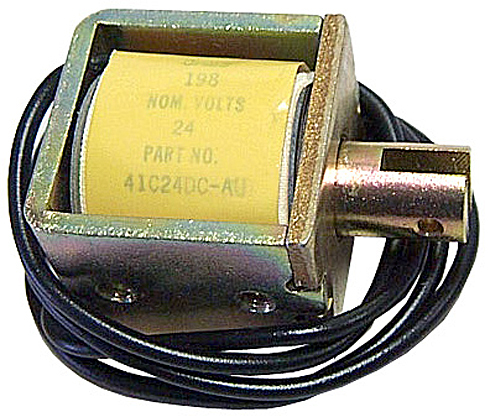 24 vdc coil. 7/8" x 2-7/8" long x 1-7/8" high. 1/4" travel. 6/32 tapped piston, 1/2" stroke. 11/16" outer diameter x 2-5/16" long. 24 vdc. Flange mount solenoid. 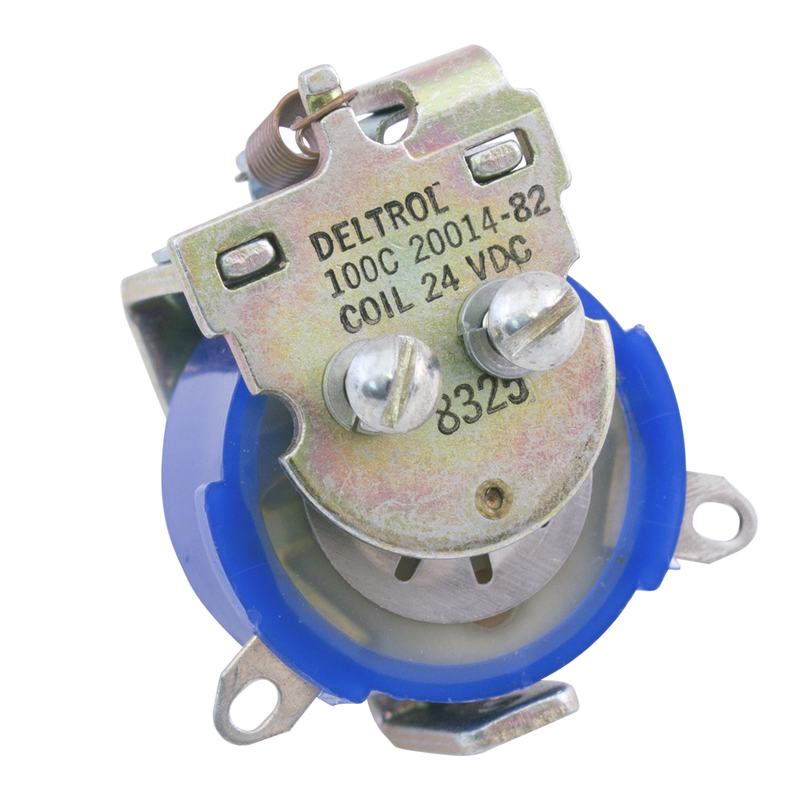 Deltrol solenoid. 1/8" x 1" shaft, 3/4" pushing stroke, 1" outer diameter x 2-3/8" behind panel. 24 vdc pulse. 5/16" diameter piston, 4-40 tapped hole, 3/8" stroke. 1/2" diameter x 1-1/2" long. Base flange. 24 vdc, 50 ohm coil. Guardian solenoid has 1/8" arm travel. Mounts by bottom #8 hole. 24 vdc, 200 ohm coil. 1-1/2" square x 1-1/4" high. Dormeyer solenoid. 24v DC continous duty. 85 ohms. 7.5 pounds force. 2-7/8"L x 1"D. Fits 3/4" mounting hole. 0.419"D forked piston. 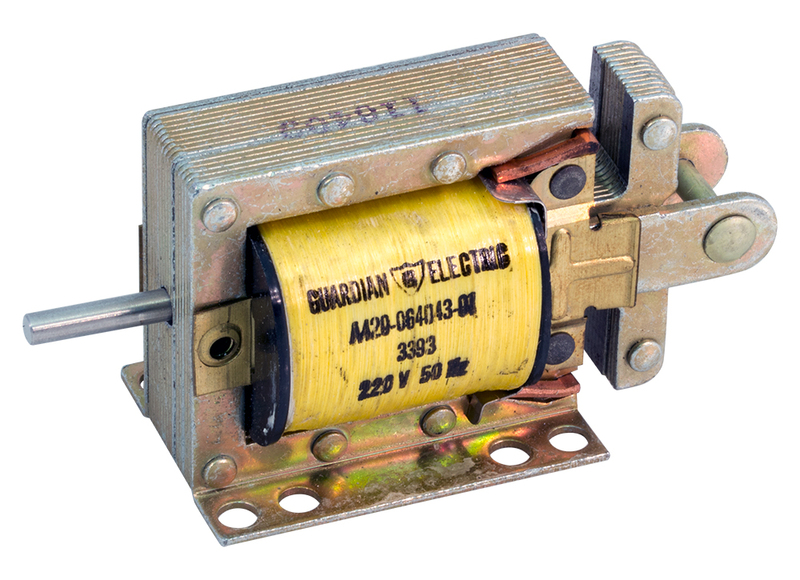 Guardian "pulling type" solenoid. 115v DC intermittent duty. 0.435" outside diameter piston with 0.184" x 0.617" fork slot with pin. Mounts via side bracket. 1" c-c mounting holes. 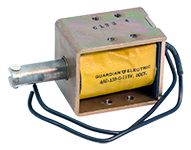 Allied Guardian linear solenoid. 28 vdc, 700ma. 1/4" plunger stroke pulls - spring return out. #6 stud at top of plunger. 1-1/4" x 1-5/8" x 2-1/2". 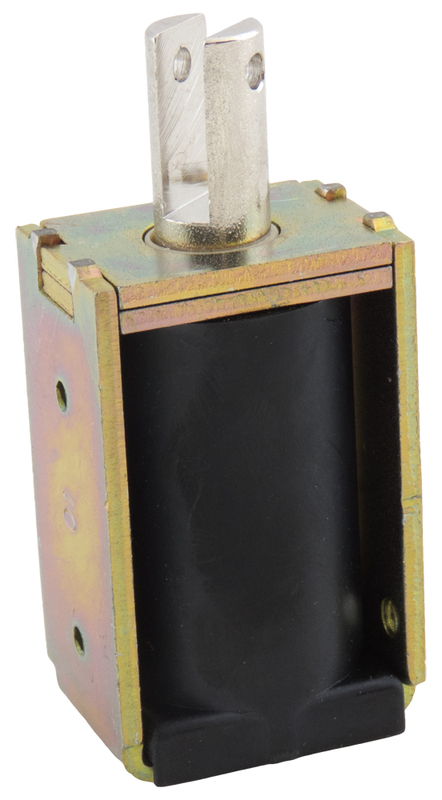 Hanell open frame, 3/8" diameter slotted solenoid. Drilled piston travels about 3/4". 8 oz. pull. Base tapped mounting holes. 1" x 2-1/2" x 1-1/4" high frame. 24-30 vdc, 115 ohm coil. 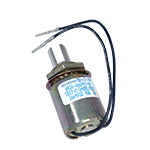 Westinghouse automotive solenoid with pushbutton switch. 1/4" pulling travel. 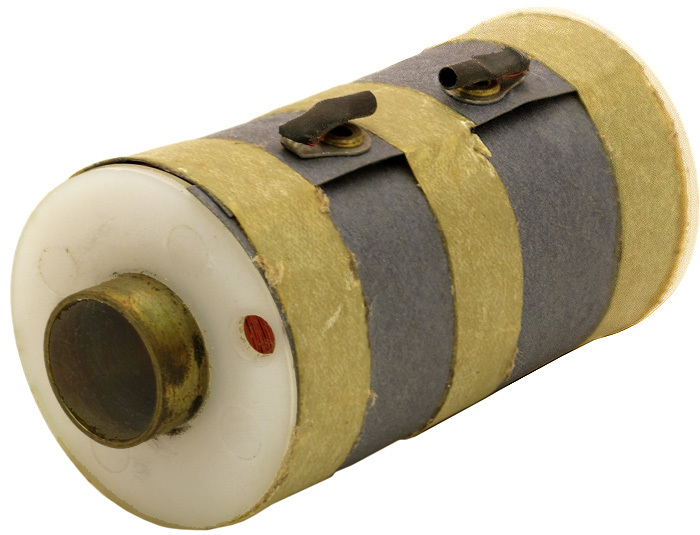 110 vac or 48-60 vdc. Made in 1959. More of a novelty vintage part than a useful one. 5950-589-5793. 20 solenoid bank originally made for IBM punch-card machine. Coils are 75 ohm DCR. 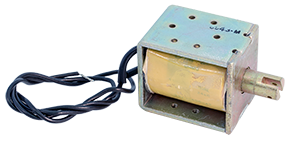 Solenoid wiring: Common terminals float above ground. 0.1" solenoid travel. Overall dimensions: 8-1/4" x 2-1/2" x 2". Guardian linear coin channel solenoid pulls 50.5 oz. at 0.12" stroke, 12 oz. at 0.75" stroke. 120 vac, 85 ohm coil. 1.625" x 1.218" x 1.437" high. 3/4" stroke on pull. Similar to Guardian 16-C-120A. 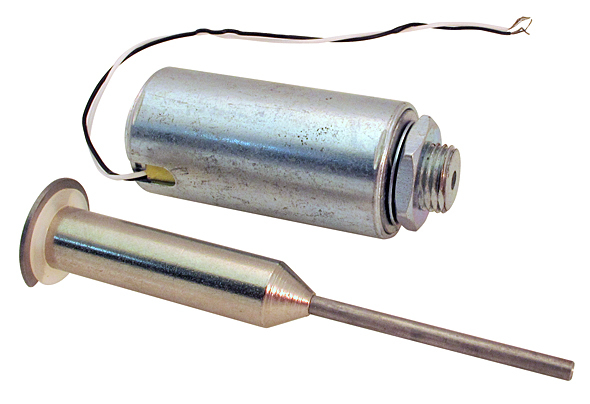 Magnetek solenoid. Pulling / linear action. 12v DC, 45 ohm coil.1/2" travel. "D" slot plunger, 5/16"D. 1-3/4" x 1" x 13/16". 1/2" slotted, drilled piston travels 1". Various tapped mounting hole hole on 3" x 1-13/16" x 1-1/2" high frame. 125 vdc, 1580 ohm coil. 3.02 pounds pull force. Sorensen solenoid. Body is 2-3/16" O.D. x 2-1/4"L. 1-3/32" I.D. plunger hole, 1-1/2" deep. Plunger NOT included. 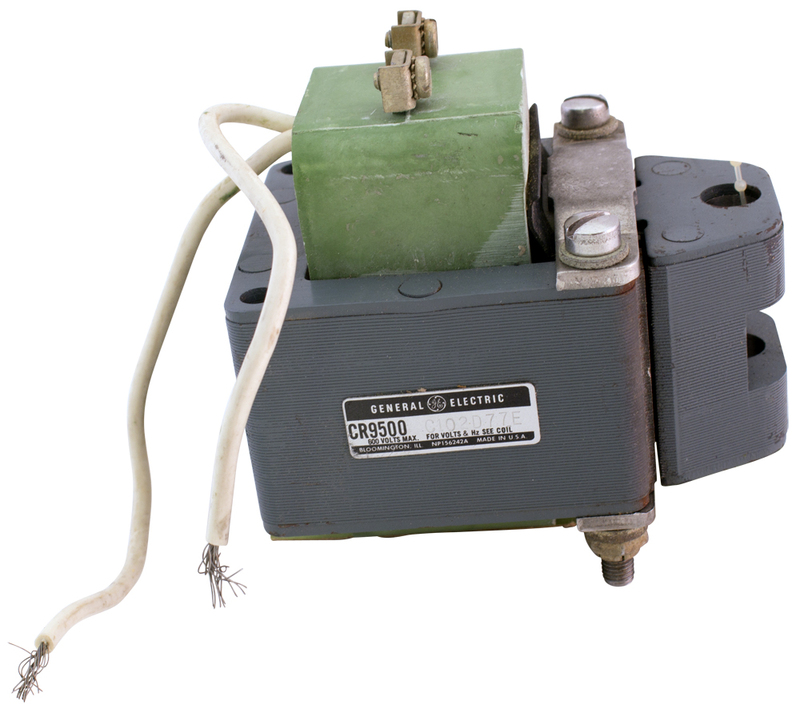 General Electric pull form solenoid. 550 vac @ 60 Hz. 2-5/8" x 2-3/8" x 3-1/2"H (fully pulled in). Solenoid plunger. Slotted head for pivot attachment. 0.311" diameter x 1.67" long. 0.088" diameter hole. 0.078" x 0.375" slot. General Electric heavy duty solenoid coil. 2-5/8" x 3-5/8" opening. 2-1/4" thick. Furnas magnetic coil. 208-240v, 60 Hz. 1-5/8" x 1-1/4" x 1" body, 3/8" x 5/8" rectangular centerhole. Guardian solenoid. 28v DC. 1-3/16" x 7/8" x 1-3/4"H. 0.316" plunger required. NOTE: Plunger NOT included. Hart-Advance. Drilled piston has 10/32 tapped hole, travels about 1/2". 1" x 1-1/4" x 2" high frame. 24 vdc. 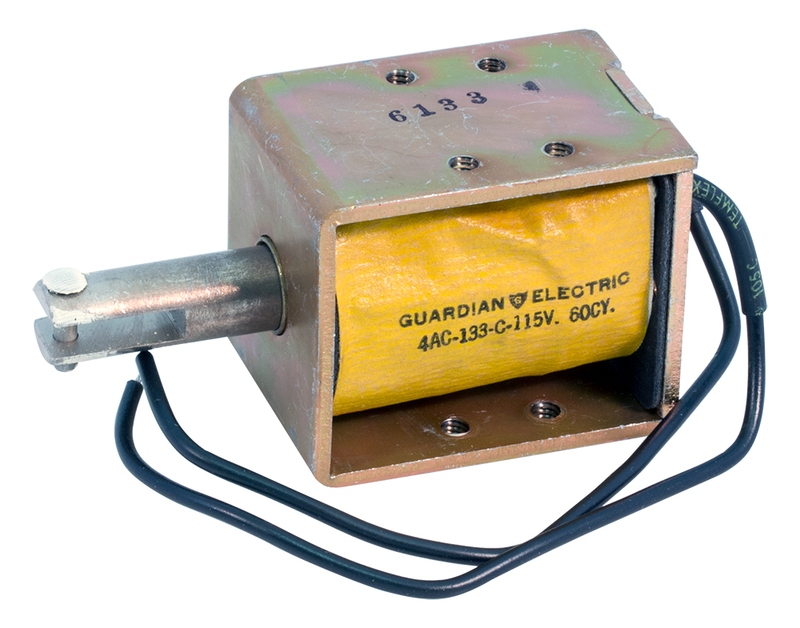 Guardian open frame slotted piston motor. .312" diameter slotted drilled piston travels about 3/4". Various tapped mounting holes on 1" x 1-7/8" x 1-3/16" high frame. 24 vdc.1.56 pounds of linear force.Pulling type actuator. Deltrol. 5/16" diameter slotted, drilled piston travels about 3/4". 15 oz. pull. 7/8" x 1-5/8" x 1-1/16" high frame. 2.8 vdc, 1.4 ohm coil. Guardian. As above but 1/4" diameter piston travels about 1/2". 3/4" x 1-1/4" x 3-1/4". 24 vdc.